Enemies: Justin Baldwin, Alex Bow, Speedball (Robbie Baldwin), and lots of blackmailers. 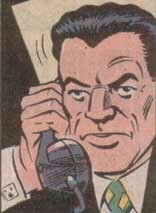 Powers/Abilities: Boder had a wealth of money and resources to use to further his criminal organization. History: (Speedball#9 (fb, BTS))- Boder was a wealthy man, but the more money he had, the more he wanted. He turned to crime and set himself up as the head of Springdale's criminal element. Eventually Alex Bow learned of this and tried to blackmail him. Boder killed Bow and had Otto Clase hide the Springdale High School as it was being constructed. Boder hid the death by making it appear Bow had simply left town and even had fake cards sent from Bow to his friends long after Bow was dead. (Speedball#4)- When the Skeleton of Bow was discovered, Boder hired cat burgaler Fred Caskey to break into the school to locate and remove a strongbox that contained information that could incriminate him. Caskey was captured and gave the strongbox to the police. Knowing that the strongbox would lead police to Clase, Boder had him poisoned and made it look like suicide to throw off investigation. (Speedball#6)- Boder attended a private reception celebrating the upcoming opening of a city historical exhibit. 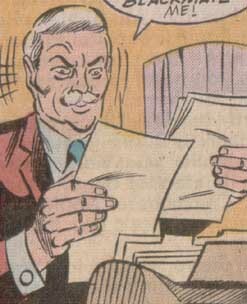 (Speedball#7)- When a clerk at the Springdale community courthouse found a file with evidence that connected Boder to Bow's murder, he, working with others, attempted to blackmail Boder. Boder hired the Harlequin Hitman to kill all the blackmailers and the Harlequin Hitman was successful. Even after the assassins were captured, they knew too little about Boder to give the police any information. The clerk had hidden the file away in some part of the courthouse nobody would find it. (Speedball#8)- Attending the Founder's Day Reception in the park, Boder is not surprised when people begin discussing Bow's murder. (Speedball#9)- Boder realized he had to put an end to Justin Baldwin's snooping into the Alex Bow murder and got Dorian to take care of it. First Dorian killed Lola because she knew too much, then began to search for the files in the courhouse. When Baldwin managed to get the files first, Dorian captured Maddie Naylor and used her as a hostage to get Baldwin and the files to Boder's home. 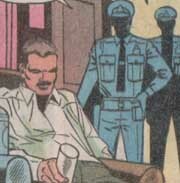 Boder was prepared to kill Baldwin and Naylor and destroy the files, but Speedball arrived and knocked Boder, Dorian and their gang out. In the end, Boder and his gang were taken into police custody. In his first appearance Boder was seen only in the shadows. After that he was seen either in shadow or as a nameless face attending some Springdale community event. It wasn't until Speedball#9 that the face was given a name and revealed to be the one behind the murder. Nathan Boder definitely was a man who thought he could solve all his problems by killing them. The Alex Bow murder was the only real running storyline in the Speedball series. Alex Bow was a part-time employee of Otto Clase. Learning of Clase and Nathan Boder's illegal activites he sought to blackmail them. Boder killed Bow and had Clase hide the body in the walls of a high school he was building. In his youth Bow was friends with Justin Baldwin and Herb and Sheila Hollister. He also dated Lola and Maddie Naylor. When Justin Baldwin found out that Bow was actually "conniving, dishonest scum" he protected him anyway, which he regretted in his later years. Once, during a vacation to New York with Maddie Naylor, Bow tried to force himself on her. When she refused Bow abandoned her in the city with is unpaid bill, which she was unable to pay. She wound up being arrested and her parents needed to bail her out. Otto Clase was a contractor who worked with Nathan Boder and was engaged in fraud. Once of his part-time employees, Alex Bow, learned of the illegal activites and planned to blackmail Boder, but Boder killed him and got Clase to hide the body in the walls of the Springdale High School that Clase was building. Years later, after Clase had retired, Bow's body was found and the police found evidence connecting the murder to Clase, but found Clase dead in his home, poisoned. Police were uncertain if Clase had committed suicide or been mudered. The unnamed clerk at the Springdale courthouse found information in a file that connected Nathan Boder to the death of Alex Bow. Working with Emil Conroy (who was in turn working with Phillip Barton, who in turn worked with others) the clerk attempted to blackmail Boder. Boder responded by hiring the Harlequin Hitman to kill everyone in the chain of blackmailers. Learning of Emil's death, the clerk hid the file where nobody would look for it and met with Justin Baldwin. The meeting was interrupted by the Harlequin Hitman. In the ensuing fight, the clerk was killed. Dorian owned a bar in Springdale (where the drinks were overpriced, the food is lousy and the waiters are rude, according to Officer LaGuardia) and he was also Springdale's foremost organized crime figure. As such he worked with Nathan Boder. Trying to help clear up the Bow mess Boder employed Dorian to kill Lola. Dorian then forced Skipper to find the files hidden in the Springdale Courthouse. When Skipper told him that Robbie Baldwin had taken the files he first tried to kill Robbie, then kidnapped Maddie Naylor. When Speedball arrived in Boder's home Dorian and his gang were taken down and arrested. Lola was a waitress who had once dated Alex Bow. When Maddie Naylor came to ask her if she could help track down one of Bow's old business associates Lola offered no help at all. After Maddie had left, Lola called Boder to tell her that Maddie had been snooping around. Boder thanked her and, realizing Lola knew too much, had Dorian go to her house and kill her. Skipper a young employee at the Springdale courthouse (likely an intern) overheard that Baldwin was looking Bow's files. Hoping he could make some money if he got the files himself and gave them to Baldwin, Skipper looked for them during the night. When Dorian showed up and demanded at gunpoint that he give the files to him instead, Skipper did as told. When Skipper found the files he put them down to get a drink of water and they were taken by Robbie Baldwin. Skipper told Dorian who had taken the files and Dorian responded by taking Robbie's mother hostage.